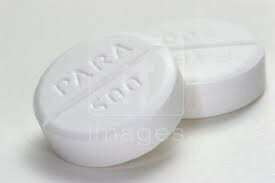 Paracetamol may interact with some other medicines, including some medicines taken to treat cancer of epilepsy. Take paracetamol exactly as directed by your doctor or pharmacist, or as directed on the label of the container. You can take paracetamol up to four times a day, every 4-6 hours, but do not take more than 4 doses of paracetamol in any 24 hour period. Never take more than the dose on the label. Taking too much paracetamol can cause liver damage. If you suspect that you or someone else has taken an overdose of paracetamol go to the emergency department. If your baby’s or child’s high temperature does not get better, or they are still in pain, speak to your GP.